Welcome to MCDS High School! Walk into any MCDS High School classroom, and you will no doubt be struck by the level of engagement of our students, the passion of our teachers, and our commitment to developing in our students the skills necessary to thrive in an increasingly interconnected world. Ours is a caring community, dedicated to our world, our school, and each other. This approach carries over to the college admissions process, as well. 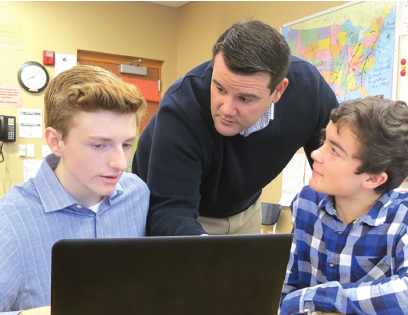 As Madison’s only independent college preparatory school, MCDS views the college admissions process as an opportunity for self-understanding and growth, and we are committed to preparing students for success at the collegiate level. As in our academic program, our focus is on the individual student. Our graduates have attended some of the most selective colleges and universities in the world, but most important to us is that we help them find colleges and universities where they will thrive as individuals. The commitment to the whole student extends beyond the classroom, of course, and our high school students have the ability to participate in our extensive interscholastic athletic offerings, clubs, and student groups, as well as take part in our spirit weeks, homecoming festivities, and many social events. I invite you to visit our campus and see for yourself all that makes the MCDS High School experience truly unique. After you speak with our students and faculty, see our newly expanded academic building, and experience our inspiring setting, you will appreciate why the MCDS High School is unlike any other in the Madison area.